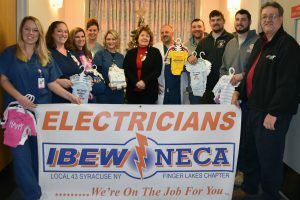 OSWEGO -The IBEW Local 43’s apprentice class recently stopped by Oswego Hospital’s Maternity Center to donate baby items for new families as part of a class service project. Pictured from left, Amanda Carswell, unit secretary; Kim Spurling, RN and director of Oswego Health’s OB-GYN Department; Kristen Fox, RN; Laura Cooper, RN; Kristin Conger, RN; Karen Ferguson, Oswego Health Foundation director; Raj Mahajan, MD; apprentices Jesse Kilmer, Alex Whitcomb and Eamon Lacey, with instructor Richard Shopland. 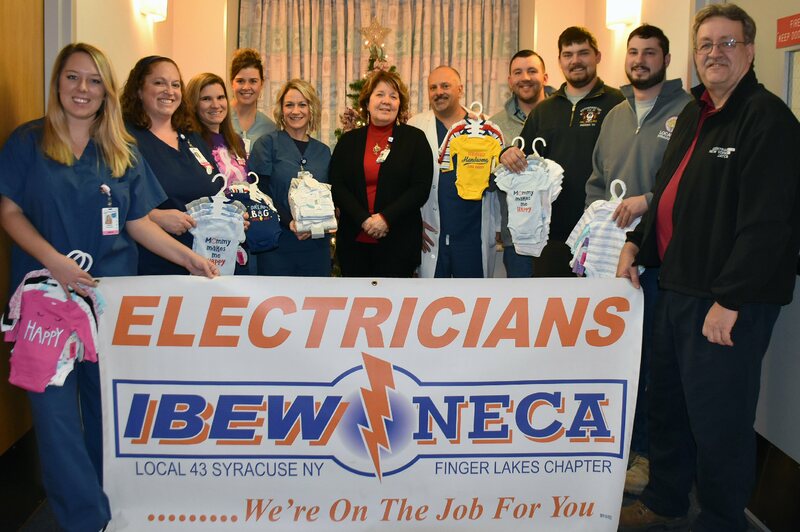 To support the project, class members collect bottles and cans throughout the year through the IBEW’s Cans for Kids program. The funds are then used to purchase items needed by area hospitals and other organizations. Oswego Health’s Maternity Center offers families a comfortable and homey environment; featuring attractive private rooms, each with its own bathroom containing a large soaking tub. This environment is complemented by the latest technology. A caring and knowledgeable staff oversees the entire family’s needs. To learn more about the Maternity Center or to arrange a tour, please call 349-5572.